Bluegrass Pundit: Health Care and Education Reconciliation Act of 2010 (H. R. 4872 ) also required territories to establish exchanges to get funds. Health Care and Education Reconciliation Act of 2010 (H. R. 4872 ) also required territories to establish exchanges to get funds. The Supreme Court will rule this spring on the King v. Burwell claim the Patient Protection and Affordable Care Act (Obamacare) only offers premium subsidies “through an Exchange established by the State," as plainly stated in the law. The term through an "Exchange established by the State" is written in two places in the ACA. 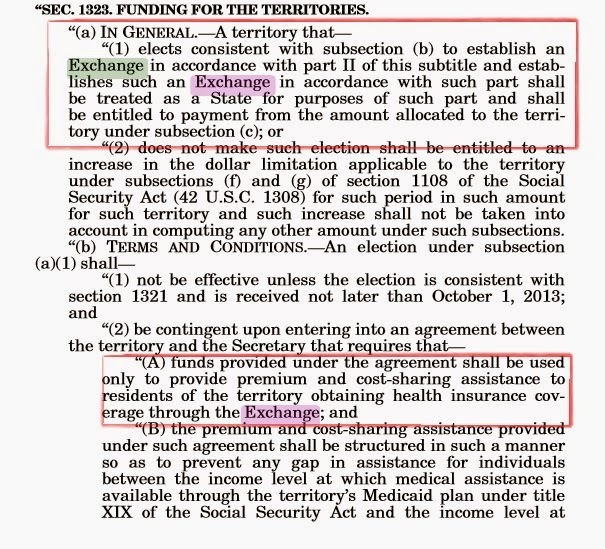 Democrats claim this was just poor use of language due to the rush they were in to pass Obamacare, but the Health Care and Education Reconciliation Act of 2010 (H. R. 4872 ) which amended Obamacare specifically states territories only get funds if they establish an exchanges. One mistake in language might be believable, but not three.